How confident is your law firm in its document review process? 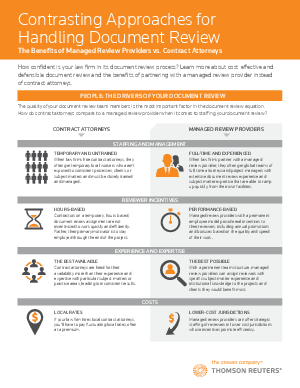 Learn more about cost-effective and defensible document review and the benefits of partnering with a managed review provider instead of contract attorneys. According to a recent study of Alternative Legal Service Providers (ALSPs), the use of ALSPs such as managed review providers for document review is expected to grow by more than 50% in the next five years. The top reasons cited for using such providers aligned with the benefits listed here: to control costs and meet peak demand without increasing permanent headcount.